Headquarters of the German paratroopers before being taken over by the American paratroopers, it is currently a museum dedicated to the former. Discover the story of this house which holds a unique and authentic collection of artifacts. Here, the men of the 6th German parachute infantry regiment (PIR) nicknamed the «Green Devils » fought fiercely for three days against the American paratroopers of the 101st Airborne Division. On the morning of June 6 1944, the Commander of the German paratroopers, the major von der Heydte established his headquarters whereas the Dr Roos set up an aid station. On June 8, as the Germans withdrew to Carentan the American Colonel “Iron Mike” Michaelis established the headquarters of his unit, the 502nd PIR of the 101st Airborne. But why this strange name ? In the village, it is said that the house is haunted! Some feel wandering souls there. Others feel uneasy due to the catchy reenactment. 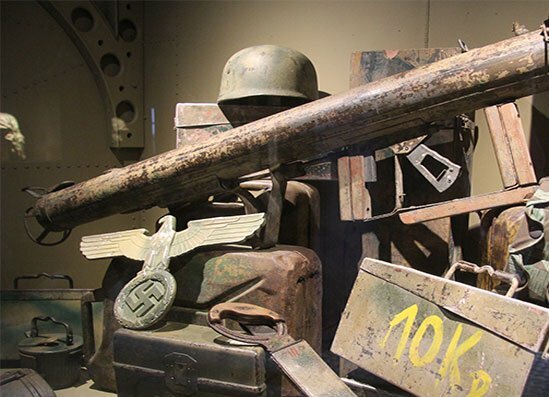 Through authentic artifacts that belonged to German paratroopers you will discover the strategic challenge with the city of Carentan and why this Dead Man’s Corner was so crucial during the seizure of this city. By visiting this place, you will step into history, learn more about both the meaning of this name and the men who fought at this very place. What if the artifacts could speak? The «Green Devils» are waiting for you. 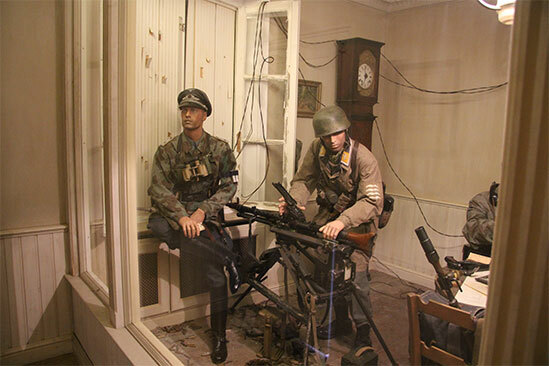 As you enter this famous house in which the bloodshed took place, you will be engrossed in the atmosphere of the very first moments of the landings as lived by the Germans. The events that took place here have been carefully recreated by the means of authentic artifacts to get you immersed at the core of history. Said artifacts were recovered from the ground for a large part of them and have shaped history. And their story is told by the very eyes of Major von der Heydte.